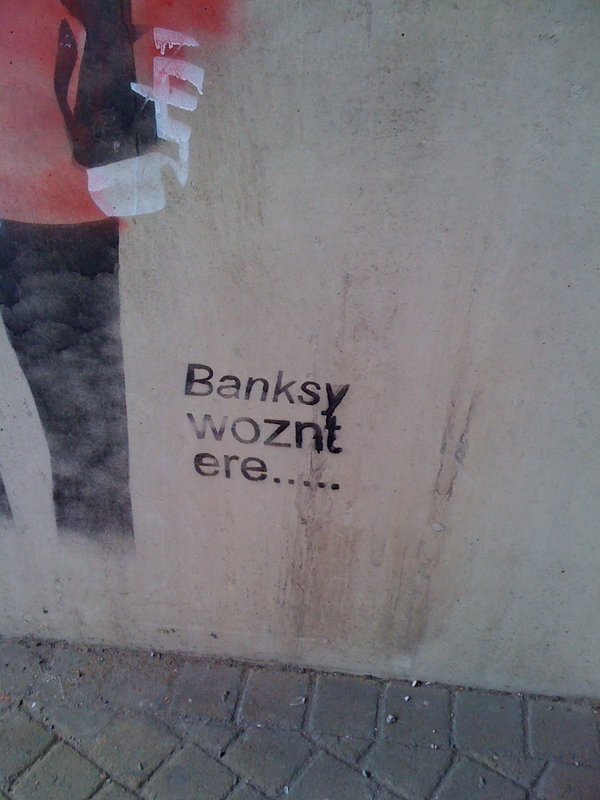 In the last few months some Banksy-esque graffiti has appeared at locations around Newport. I wrote about it here but more have appeared since then. 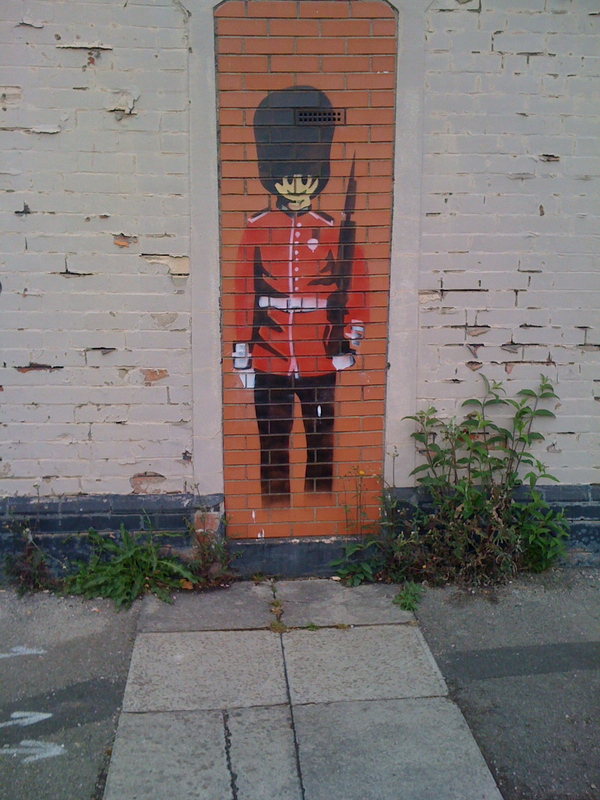 Every other city has its Banksy imitators, so why not Newport? Does it mean that Newport is becoming middle class? Or is it just vandalism? And why can’t the graffitist do feet? Whatever the answers, I’ve gathered the pics together for your viewing pleasure. And there’s an item from the South Wales Argus also reproduced below dealing with Newport council’s response. 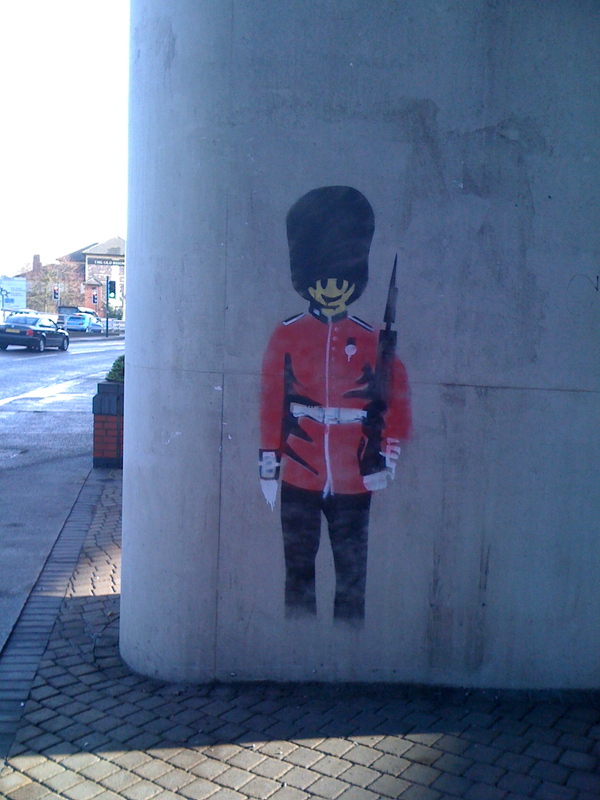 I first spotted this image which appeared on a pillar beneath the Heidenheim Drive flyover on the entrance into Newport. I drive past it most days. After a while the slogan was added, just in case there was any suggestion that the famous graffiti artist had crossed the Severn Bridge. 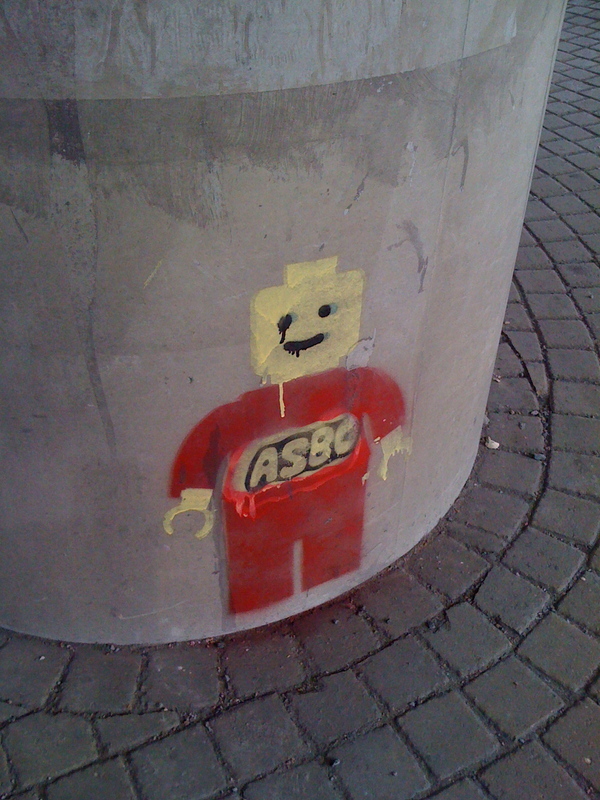 And, about the same time, I noticed a new image, the lego/asbo man. After uploading the first picture to facebook, I was told about this one. Nearby in the bricked up doorway of a bricked-up house. Mrs M snapped this one in the subway near the castle. It looks worse for wear. And finally, within the last week I spotted this one. 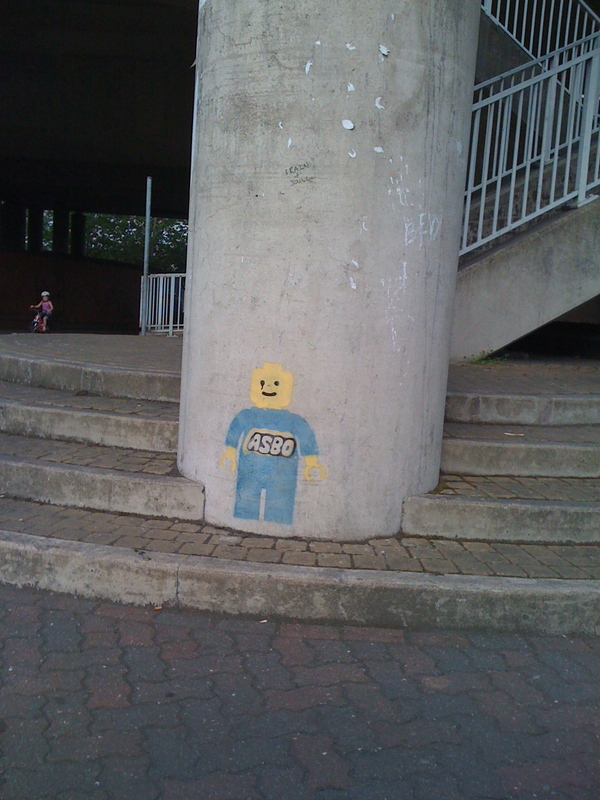 Also on a pillar beneath the Heidenheim Drive flyover. GRAFFITI artists in Newport are being invited to find out how they can use their talents without breaking the law. Environment and community cabinet member for Newport council Cllr William Routley is asking graffiti artists to join him for a “no blame” meeting to talk about their craft. The councillor said he has to take the view that graffiti of any kind is “unacceptable”, but would “welcome dialogue in order to understand what artists needs are”. The councillor, who represents the Stow Hill ward, spoke of his respect for some of the artists’ talents, but urged them to use their abilities “in co-operation, in a way that contributes to city life”. 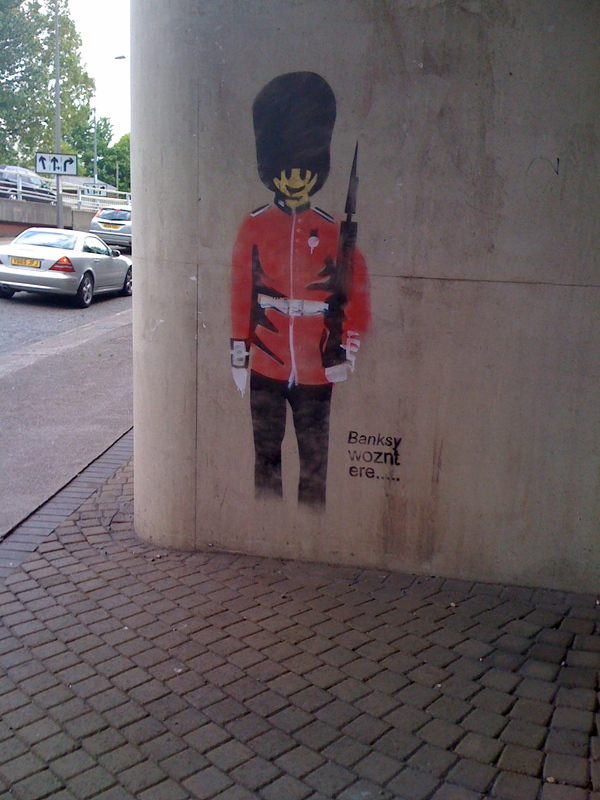 Speaking of the most recent “Banksy” style graffiti which has sprung up around Newport city centre showing a stylised soldier figure, Cllr Routley said: “Beauty is in the eye of the beholder, so to have some things thrust upon us without any choice is not acceptable. Local gallery owner, Janet Martin says she was refused council support for a graffiti workshop earlier this year at her premises in New Ruperra Street. She wanted an outside wall of Barnabas Arts House to be used in a “controlled piece of graffiti”. “Pictures of backsides and swear words is vandalism” said the mum of two, “but if Newport wants to get art out into the community then there is a gap in the artistic market. Some of the walls around the place are a mess. Artists can contact Cllr Routley via the council website. When I spoke to him for about the graffiti for that Argus article Cllr Routley seemed genuinely interested in meeting the people who done it. Despite being careful to provide the ‘it’s not acceptable’ quote he seemed to think they could have contributed to brightening up the concrete jungle in another way. nobody will come “forward ” because they feel it could wreck there so called street cred if there’s any there……”mooseman” stencils im gassing I think hes given up the act now thogh 🙂 enemie…. Not you then Enemie? Where are yours? I’ll keep an eye out for them. Stencils are street art, not graffiti. Graffiti is tags, throwups, bombing etc..
Street art gets noticed easily by the public cos it’s accessible, easy to understand and pretty basic, and of course to somebody who doesn’t understand or appreciate proper graffiti, it looks better. There’s a lot of graffiti in Newport if you know what you’re looking for, but usually it’s only writers noticing other writers, or if joe public does see it it’s hard to understand or put a name to. I personally think street art and stencils are cheap, but each to their own. Much respect to the graffiti writers who’ve been up for a while now in Newport and keeping the (tiny) real scene alive. Bles, Blunt, Desk, Eks, Elvs, Aep, Maze etc..
As much as I’m not big on stencils and street art, props to Enemie too for getting up and putting in work. This so called “artist” recently tagged my building. It’s not art, it’s just plain ugly. 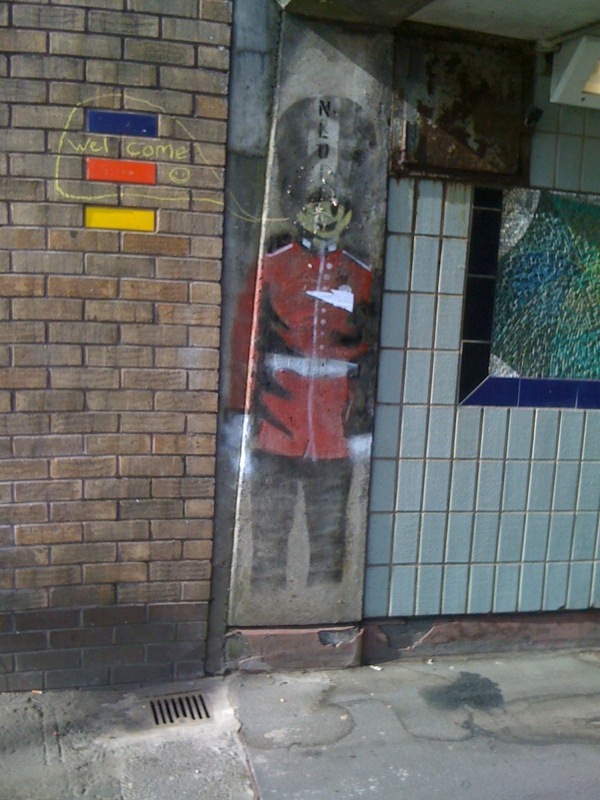 Next time do one of the london guards at the entrance to my building, not one of your lame tags. I think Enemies art speaks direct from youth subculture and i want to see more! Fair play to the lad the pieces are immense much better than illegible tags I’ve seen on monuments and tourist areas across EU. Shame there isn’t a decent space for street artists to work from hone their skills and brighten our days.